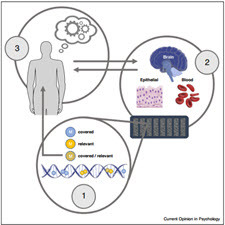 The recent interest in epigenetics within mental health research, from a developmental perspective, stems from the potential of DNA methylation to index both exposure to adversity and vulnerability for mental health problems. Genome-wide technology has facilitated epigenome-wide association studies (EWAS), permitting ‘hypothesis-free’ examinations in relation to adversity and/or mental health problems. In EWAS, rather than focusing on a priori established candidate genes, the genome is screened for DNA methylation, thereby enabling a more comprehensive representation of variation associated with complex disease. Despite their ‘hypothesis-free’ label, however, results of EWAS are in fact conditional on several a priori hypotheses, dictated by the design of EWAS platforms as well as assumptions regarding the relevance of the biological tissue for mental health phenotypes. In this short report, we review three hidden hypotheses — and provide recommendations — that combined will be useful in designing and interpreting EWAS projects. Understanding the biological mechanisms by which early psychosocial adversity associates with long-term mental health problems may have the potential to facilitate the development of effective screening, intervention strategies and health policy decisions . Recent research has focused on the degree to which adversity disrupt gene regulation through epigenetic processes, thereby providing a mechanism by which the environment can have lasting effects on measurable mental health phenotypes . High profile studies suggest that epigenetic changes associated with early adversities and even lifestyle choices can be observed across the life span, and that these long-term epigenetic modifications are associated with risk for a range of health outcomes . These studies have generally focused on DNA methylation (DNAm) for two reasons: it is currently the best understood epigenetic mechanism and array-based technologies are readily available, which provides coverage of hundreds of thousands of methylation sites across the genome . This combination of basic science and genome-wide technology has facilitated numerous epigenome-wide association studies (EWAS), permitting ‘hypothesis-free’ examinations in relation to adversity and/or mental health problems. علاقه اخیر به اپی ژنتیک در تحقیقات سلامت روان از چشم انداز توسعه، منجر به پتانسیل متیلاسیون DNA می شود تا به عنوان شاخصی از نواقص و آسیب پذیری برای مشکلات سلامت روانی را نشان دهد. فن آوری گسترده ی ژنوم، مطالعات مربوط به همبستگی گسترده ای را (EWAS) را امتحان کرده است، که امتحانات “فرضیه رایگان” را در رابطه با ناتوانی و / یا مشکلات سلامت روان فراهم می کند. در EWAS، به جای تمرکز بر ژنهای نامطلوب پیش تعیین شده، ژنوم برای متیلاسیون DNA غربالگری می شود، بنابراین امکان نمایشی جامع تر از تغییرات مرتبط با بیماری پیچیده را فراهم می کند. علیرغم برچسب “فرضیه رایگان”، با این حال، نتایج EWAS در حقیقت بستگی به چندین فرضیه پیشین است که توسط طراحی سیستم های EWAS و نیز فرضیه های مربوط به ارتباط بافت بیولوژیکی برای فنوتیپ های روان شناختی تعیین شده است. در این گزارش کوتاه، ما سه فرضیه پنهان را بررسی می کنیم و توصیه هایی ارائه می کنیم که در طراحی و تفسیر پروژه های EWAS مفید خواهد بود. درک مکانیسم های بیولوژیکی که منافع روانشناختی اولیه با مشکلات سلامت روان درازمدت مرتبط می شود، ممکن است به تسهیل توسعه غربالگری موثر، راهبردهای مداخله و تصمیم گیری های سیاست های بهداشتی کمک کند. تحقیقات اخیر بر این نکته تأکید دارد که ناتوانی در تنظیم فرآیندهای اپی ژنتیکی باعث اختلال در تنظیم ژن می شود و از این طریق مکانیسم ایجاد می کند که محیط می تواند اثرات پایدار بر فنوتیپ های قابل اندازه گیری سلامت روان داشته باشد. مطالعات انجام شده نشان می دهد که تغییرات اپی ژنتیکی در ارتباط با پیش آگهی های اولیه و حتی انتخاب شیوه زندگی در طول عمر مشاهده می شود و این تغییرات درازمدت اپی ژنتیکی با ریسک طیف وسیعی از پیامدهای سلامت همراه است. این مطالعات به دو دلیل به طور متمرکز روی DNA متیلاسیون (DNAm) متمرکز شده است: در حال حاضر بهترین مکانیزم اپیزیونیک شناخته شده است و تکنولوژی های مبتنی بر آرایه به راحتی در دسترس هستند که پوشش صدها هزار مکان متیلاسیون را در سراسر ژنوم پوشش می دهد. این ترکیبی از علم پایه و تکنولوژی گسترده ی ژنوم، مطالعات ارتباط گسترده گسترده ای را (EWAS) را امتحان کرده است، که اجازه می دهد امتحانات بدون فرضیه در رابطه با مشکلات و یا مشکلات سلامت روانی باشد.